Toyota has a social network for people nuts about their cars. 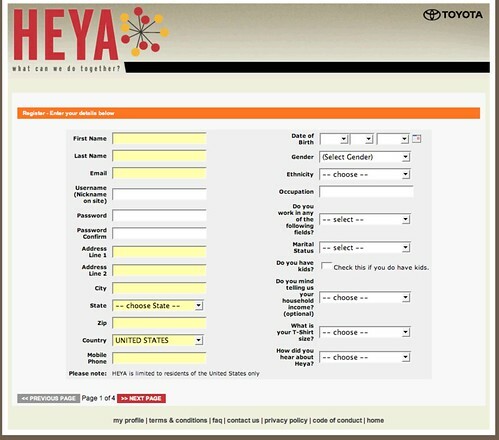 Since I’ve already built my own Prius web site I figured I’d sign up. If you want folks to sign up for a social network, where they will do the work, they will create the content and they will support the community, ask for their e-mail address and a password. Get the rest of the information later. Yikes – do they conduct background checks also? I was going to start a wish list at Sears.com and they asked for my mother’s maiden name in case I forgot my password. They have to be kidding. I’ve been on the internets for years and years, this is the first time I have seen anyone asking for such private information for a trivial wish list. This reminds me of that hilarious George Carlin skit where he talks about how many buttons they make you push at the cash register now, totally negating the need for cashiers.Apparently we are all supposed to become social networking engineers as well now. I blame the selfcheck-out at grocery stores for these new trends.